Boston: Original, 1974. Original. Single Sheet. Very Good. 7 1/4 X 10 1/2 Inches. 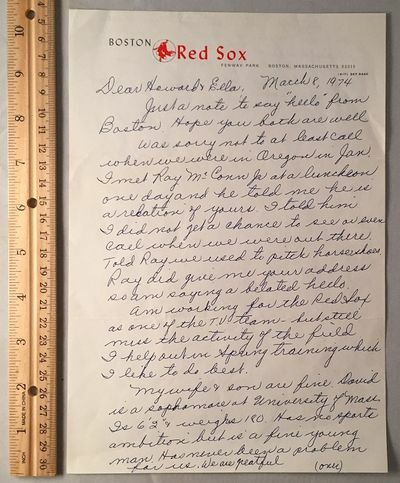 Original lengthy letter in the hand of Johnny "Mr. Red Sox" Pesky on official Red Sox stationery. Pesky batted a lifetime .307 average and was affiliated with the Red Sox is some form or fashion for over 60 years. He was a noted friend of Ted Williams and is the namesake of "Pesky's Pole" at Fenway. Here Pesky writes to friends (Howard and Ella) in Oregon to tell them that he is "...working for the Red Sox as one of the T.V. team - but still miss the activity of the field. I help out in Spring Training which I like to do best." Full page and a quarter ALS. Fold marks from mailing, otherwise fine condition.